So what? That’s a good thing right? 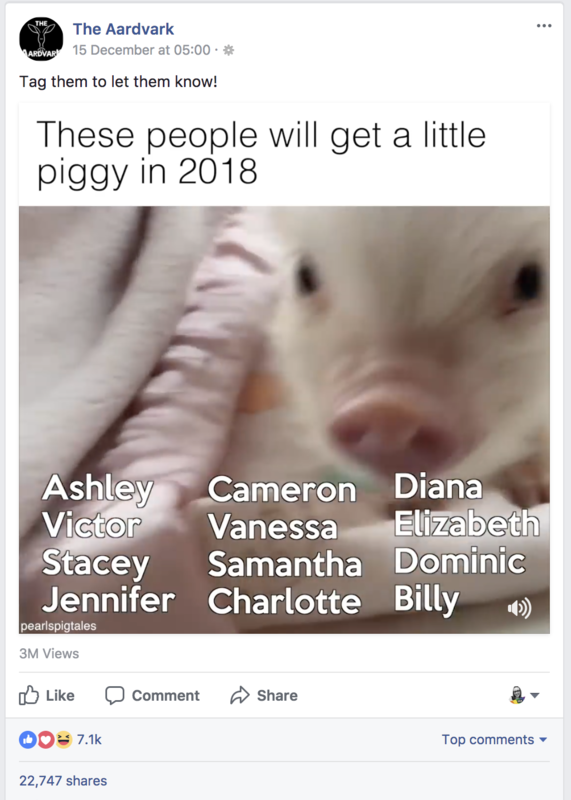 You hate getting tagged in those stupid “These people will be getting a pig this year!” posts (don’t laugh, it’s actually a thing). Well, yes and no, if you run competitions on Facebook with the aim of increasing your likes or ask people to “comment YES below to enter!” – you could be impacted. But seriously, check out the engagement. No wonder Facebook is taking action. Source: The Aardvark. 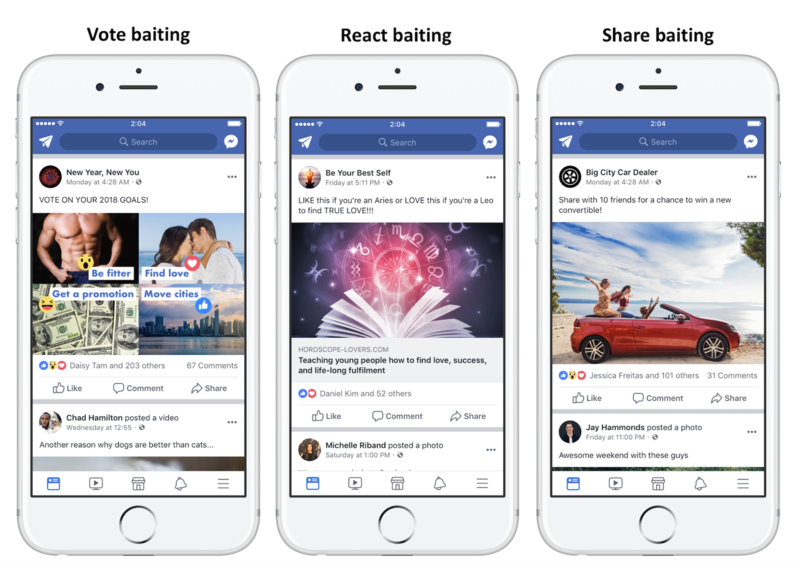 Engagement baiting is a common tactic used by businesses to trick the Facebook algorithm. If they post a couple of these spammy ‘comment YES below!’ type posts, they get heaps of engagement which boosts their ranking in the algorithm, meaning their regular, less spammy content gets seen by more people. 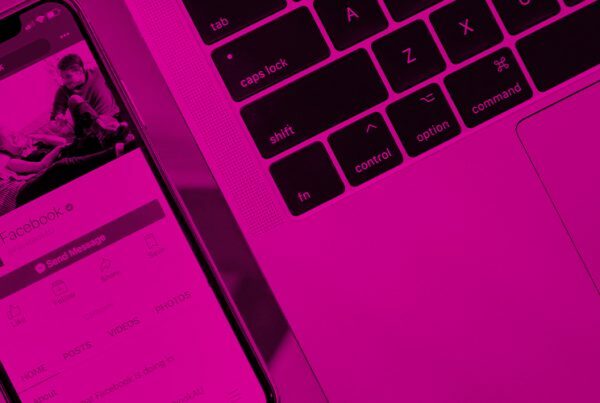 They give some pretty clear cut examples in their post – check out the last image – not only are they going to get heavily penalised for their engagement bait, but they’re blatantly and unashamedly flouting Facebook’s competition rules. Very naughty indeed. From Facebook’s newsroom article – examples of ‘engagement’ baiting. Source: Facebook. 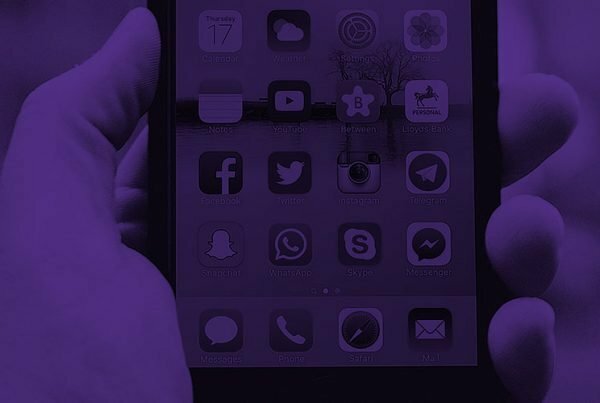 For obvious reasons, Facebook aren’t really fans of people and pages who bend the rules and trick their cleverly crafted algorithms, so they’re clamping down – and your competition posts are likely to suffer as a result. Depending on the goal of your competition and the entry method you choose, you may end up running a ‘like to win’ or ‘comment to win’ competition which requires entrants to (you guessed it) like or comment on a post in return for an entry. Facebook make a point of saying the penalties will apply for pages that “systematically and repeatedly use engagement bait to artificially gain reach” so if you’re running a one-off competition, you’re unlikely to feel the wrath of Facebook, but if you run daily, weekly or monthly giveaways of this ilk, you could quickly find yourself in hot water. So how can you avoid getting penalised? 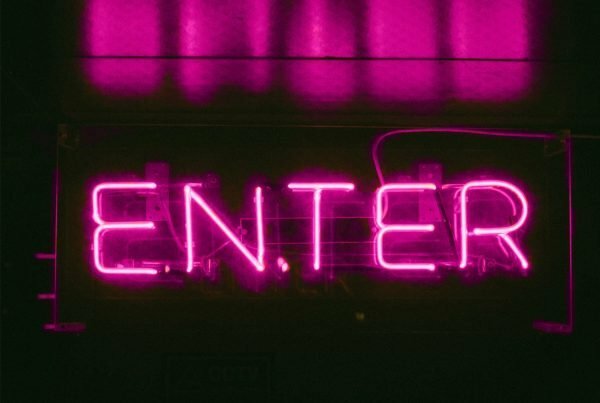 Luckily for you, we’re on hand to show you that this change is actually awesome news for your competition and rather than resenting the change, we’re embracing it whole-heartedly. Instead of “Comment, Tag and Share for your chance to win a new outfit for you and a friend” (which by the way is against Facebook’s rules), ask them to post a photo of your/your friend’s wardrobe fail/win. Photos are amazing for encouraging natural engagement amongst your followers. Instead of “Vote for your favourite and we’ll pick a winner at random”, you could ask your audience to tell you in the comments which is their favourite and why, then pick a winner based on their responses. Not only does this boost authentic responses, but it turns into a game of skill which therefore doesn’t need a licence – win win! We are really excited about this change, because it means people will have to think about creating more meaningful competitions rather than throwing out a like and comment competition that may boost your post’s popularity in the short-term, but does nothing for your business – or sales – in the long term. Not sure how these changes will affect you and your business or need help planning a competition that won’t land you in Facebook jail? Get in touch with us for a FREE 15 minute competition chat, as you can see, we LOVE talking about your competitions! Completely agree with this, Suki. Thanks for writing this up! You’re welcome, Lucy! Thank you for the comment!